It seems that every aristocratic family in Sicily has an interesting story about how their ancestors came over with the Normans or Swabians. And who knows? A few of those fanciful tales may even contain an ounce or two of truth. More often, a family ennobled through purchase of a barony in the seventeenth century hurriedly invented a history reflecting a much earlier ennoblement during the Middle Ages, medieval warrior knights being more interesting than greedy baroque landlords. A few families didn't have to "invent" anything. Unfortunately, most of these medieval families are extinct today. The Abbatellis family is a good example. Their origins are obscure, but it is thought that the Abbatellis clan came from Lucca but may have had Catalan ancestry in earlier times. A certain Dulcio Abatellis or Abbatelli is said to have arrived in Sicily in 1237 during the reign of Frederick II. Such a migration would not have been unusual during that period. 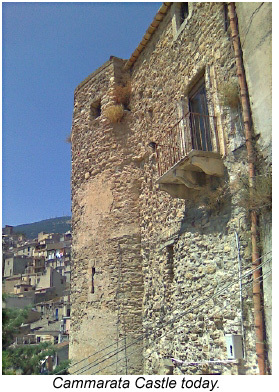 Dulcio's descendant, Giovanni, purchased the barony of Cefalà in 1405 from Raimondo de Flagar. In 1429 he obtained a licence to charter a town on this fief. In 1431, the family purchased the barony of Cammarata in the Sicanian Mountains. This vast territory overlooking the scenic Platani Valley was soon elevated to a county. 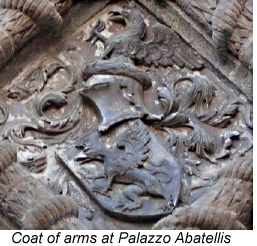 Above the main portal of the Abbatellis residence is their coat of arms, a rampant griffon in a typically medieval configuration and style (shown here). Around the time Palazzo Abbatellis was being built, the main branch of the family ran out of male heirs, and in a bizarre twist young Margherita Abbatellis Branciforte was betrothed to her uncle, Federico Branciforte, to keep the wealth in the family. This Federico became, by right of his wife, the count of Cammarata in 1503. Apart from the incestuous union with his niece, Federico Branciforte was generally an unsavoury character motivated by greed. He conspired against the viceroy, Ugo Moncada, and was executed for his treachery. This left Margherita single and again an heiress. She wed another Branciforte, Blasco, by whom she bore a son. Today the Abbatellis blood is preserved in their descendants, but the Branciforte family itself no longer exists in the male line, the Lanza di Trabia being their heirs. A distantly-related branch of the Abbatellis family flourished in Catania into the seventeenth century, but the lesson in this question of the extinction of noble families is that the men - "noble" or not - should have spent more time with their wives than their mistresses, and less time conspiring against the crown. About the Author: Palermo native Vincenzo Salerno has written biographies of several famous Sicilians, including Frederick II and Giuseppe di Lampedusa. This article is the second in our Historic Families series.